TLJ Daily E-Mail Alert No. 2,186, December 22, 2010. December 22, 2010, 2:00 PM, Alert No. 2,186. 12/21. The Federal Communications Commission (FCC) adopted, but did not release, a Report and Order (R&O) that contains rules for the regulation of broadband internet access service (BIAS) providers. The FCC issued a short release, and the five Commissioners read prepared statements. The three Democrats on the Commission, Julius Genachowski, Michael Copps, and Mignon Clyburn, backed the item. The two Republicans, Robert McDowell and Meredith Baker, opposed the item, strenuously and at length. People who advocate the interests of BIAS providers criticized the FCC's action. People who advocate the interests of edge companies either praised the rules, or argued that the FCC should have imposed more regulation on the BIAS providers. Both sides argue that they are on the side of consumers, freedom, innovation, jobs creation, and other good things. Congressional Republicans condemned the rules, and threatened to take action to block their implementation. Sen. Kay Hutchison (R-TX) stated in the Senate that she and Sen. John Ensign (R-NV) will "submit a Resolution of Disapproval under the Congressional Review Act in an effort to overturn this troubling regulatory overreach by the FCC". See, 5 U.S.C. §§ 801-808. Also, Sen. Mitch McConnell (R-KY), the Senate Republican Leader, condemned the FCC's rules and said that "we'll have an opportunity in the new Congress to push back". Rep. Fred Upton (R-MI), who will be Chairman of the House Commerce Committee (HCC) in the 112th Congress, condemned the FCC's rules, said that he would utilize the CRA to undo these rules. Rep. John Boehner (R-OH), who will be Speaker of the House in the 112th Congress, said that "the new House majority will work to reverse this unnecessary and harmful federal government power grab next year". See also, related stories in this issue titled "Congressional Republicans Will Seek to Undo the FCC's BIAS Rules" and "Commentary: the FCC's BIAS Rules and the Congressional Review Act ". There is no statute that directs or authorizes the FCC to write rules regulating the practices of BIAS providers. Because of this, and the U.S. Court of Appeals (DCCir) April 6, 2010 opinion [36 pages in PDF] in Comcast v. FCC, these rules are likely to be overturned by the judicial branch, if not first blocked by the Congress. While the FCC has yet to release the actual rules, FCC staff and Commissioners' descriptions suggest that they have similarities to the failed legislative proposal [PDF] floated in September by Rep. Henry Waxman (D-CA), the soon to be former Chairman of the HCC. He stated that the adoption of rules is "landmark action to establish a bill of rights for users of the Internet". A TLJ article on FCC adoption of rules would ordinarily include a summary of the rules. However, there are no rules to summarize. The only publicly released documents are the subjective and opinionated descriptions of putative rules offered by FCC staff and Commissioners. See, FCC release, Genachowski statement, Copps statement and Clyburn statement all of which praise the putative rules. See also, McDowell statement and Baker statement both of which criticize the putative rules. TLJ intends to write a summary of the rules, and the FCC's legal authority, at such time that the FCC finishes and releases the Report and Order. This R&O is FCC 10-201 in GN Docket No. 09-191 and WC Docket No. 07-52. 12/21. President Obama issued a statement regarding the Federal Communications Commission's (FCC) adoption of broadband internet access service (BIAS) rules on December 21, 2010. He wrote that "Today's decision will help preserve the free and open nature of the Internet while encouraging innovation, protecting consumer choice, and defending free speech. Throughout this process, parties on all sides of this issue -- from consumer groups to technology companies to broadband providers -- came together to make their voices heard. This decision is an important component of our overall strategy to advance American innovation, economic growth, and job creation." "As a candidate for President, I pledged to preserve the freedom and openness that have allowed the Internet to become a transformative and powerful platform for speech and expression. That's a pledge I’ll continue to keep as President. As technology and the market continue to evolve at a rapid pace, my Administration will remain vigilant and see to it that innovation is allowed to flourish, that consumers are protected from abuse, and that the democratic spirit of the Internet remains intact." Sen. John Rockefeller (D-WV), the Chairman of the Senate Commerce Committee (SCC), stated in a release that "I am pleased". He continued that "I believe that this effort, along with ongoing oversight and enforcement, will protect consumers and provide companies with the certainty they need to make investments in our growing digital economy. While many champions of the open Internet would have preferred a stricter decision -- and I myself have real reservations about treating wireless broadband differently from wired broadband -- I think today's decision is a meaningful step forward." Rep. Henry Waxman (D-CA), the outgoing Chairman of the House Commerce Committee (HCC), stated in a release that "landmark action to establish a bill of rights for users of the Internet and to guarantee that the Internet remains open for consumers and innovators". He added that the FCC's "framework constitutes a floor, not a ceiling, on basic protections. If the rule’s protections prove insufficient and consumers and innovation suffer, they will need to be strengthened, and I will vigorously support that effort. 12/21. Congressional Republicans sharply criticized the Federal Communications Commission's (FCC) adoption of broadband internet access service (BIAS) rules on December 21, 2010. Sen. Kay Hutchison (R-TX) spoke in the Senate. She said that the FCC acted "without Congressional authority" in "an unprecedented power grab". See, video [14:40 minutes on YouTube] of her speech. She said that she and Sen. John Ensign (R-NV) will introduce a Resolution of Disapproval. "Together we are going to submit a resolution of disapproval under the Congressional Review Act in an effort to overturn this troubling regulatory overreach by the FCC. I think that it is time to say that we have not delegated this authority to the FCC." She added that "We will have a Resolution of Disapproval at the appropriate time, in the next Congress." She also said that there will be a judicial challenge, and that "it probably will go to the Supreme Court of the United States." 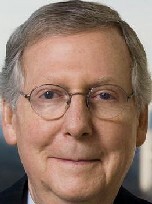 Sen. Mitch McConnell (R-KY), the Senate Republican Leader, stated in the Senate on December 21 that "the Obama Administration, which has already nationalized health care, the auto industry, insurance companies, banks and student loans, will move forward with what could be a first step in controlling how Americans use the Internet by establishing federal regulations on its use." This, said Sen. McConnell (at right), "would harm investment, stifle innovation, and lead to job losses. And that's why I, along with several of my colleagues, have urged the FCC Chairman to abandon this flawed approach. The Internet is an invaluable resource. It should be left alone." He added that "Fortunately, we'll have an opportunity in the new Congress to push back against new rules and regulations". See, text and video [1:37 minutes on YouTube]. Sen. John Ensign (R-NV) stated in a release that "Today is a sad day for innovation in this country .. As the rest of the world forges ahead, the United States will face a technological 'Lost Decade' as these new FCC rules restrict access to the Internet and stall this type of innovation in our country. I had hoped that the FCC would act in the best interest of the United States, but I was, unfortunately, wrong." Rep. Fred Upton (R-MI), who will be Chairman of the House Commerce Committee (HCC) in the 112th Congress, stated in a release that "The FCC's hostile actions toward innovation, investment and job creation cannot be allowed to stand. We must use every resource available, including the Congressional Review Act, to strike down the FCC's brazen effort to regulate the Internet. Today's vote is a sad commentary that this administration and the FCC continue to ignore the will of the American people -- our new majority is committed to protecting personal liberty and reducing the size and scope of the government. Despite FCC claims that these are just rules of the road that everyone agrees with, anyone can recognize that what the Commission claims to be statements of broad industry support are really cries of 'uncle' resulting from threats of even more onerous regulation. All the Commission has done today is further harm our economy and job growth." Rep. Greg Walden (R-OR), who will be the Chairman of the HCC's Subcommittee on Communications and Technology in the 112th Congress, state in this release that "More troubling than the substance of the network neutrality rules are the legal theories underpinning them. If left unchallenged, this power grab will allow the Commission to regulate any interstate wired or wireless communication on barely more than a whim. For all these reasons, we plan to look at all legislative options for reversing the decision. We also plan to hold a series of hearings early next year on the substance, process and claims of authority underlying this proceeding." Rep. John Boehner (R-OH) (at right), who will be Speaker of the House in the 112th Congress, stated in a release that "Today's action by the FCC will hurt our economy, stifle private-sector job creation, and undermine the entrepreneurship and innovation of Internet-related American employers. The American people are asking `Where are the jobs?´ They aren't asking for yet another government takeover that imposes more job-killing federal regulations and puts bureaucrats in charge of the Internet. Federal bureaucrats should not be in the business of regulating the Internet, and the new House majority will work to reverse this unnecessary and harmful federal government power grab next year." 12/21. On December 21, 2010, the Federal Communications Commission (FCC) adopted (but did not release) rules that regulate broadband internet access service (BIAS). A majority of members of Congress are on record as opposing new regulation of broadband. Also on December 21, Sen. Kay Hutchison (R-TX) said in the Senate that she would introduce a Resolution of Disapproval (ROD) under the Congressional Review Act (CRA) to block these rules, and Rep. Fred Upton (R-MI) issued a release that states that "Reps. Upton, Walden and Terry will look toward the Congressional Review Act of 1996 (CRA) to fight the FCC's actions." This article summarizes the key provisions of the CRA, and offers the analysis that while, hypothetically, there is a real possibility that the Congress could pass a ROD, it would be vetoed by President Obama, and hence, would not succeed in blocking the rules. However, there will also very likely be a judicial challenge based in part on the argument that the FCC lacks statutory authority. The FCC's argument that it possesses authority is weak, based upon the language of the Communications Act, and the opinion of the U.S. Court of Appeals (DCCir) in Comcast v. FCC. The Court of Appeals would likely take note of any Resolution of Disapproval. It would further damage the FCC's argument, and further diminish the already slim possibility that the Court of Appeals would uphold the new rules. 5 U.S.C. § 801 provides that "Before a rule can take effect, the Federal agency promulgating such rule shall submit to each House of the Congress and to the Comptroller General a report containing ... a copy of the rule ... a concise general statement relating to the rule, including whether it is a major rule ..."
5 U.S.C. § 802 provides that the resolution "shall be referred to the committees in each House of Congress with jurisdiction". But, "if the committee to which is referred a joint resolution ... has not reported such joint resolution ... at the end of 20 calendar days ... such committee may be discharged from further consideration of such joint resolution upon a petition supported in writing by 30 Members of the Senate". The Chairman of the House Commerce Committee (HCC) in the 112th Congress will be Rep. Upton, who opposes the FCC's BIAS rules. There will likely be far more than a majority on the HCC in support of such a resolution. In the Senate, Sen. John Rockefeller (D-WV), a supporter of the FCC's rules, will remain Chairman of the Senate Commerce Committee (SCC), and could prevent or delay the SCC from considering such a resolution. However, CRA also provides for discharge from the committee in such a situation. Thus, it would appear that moving a Resolution of Disapproval through the House and Senate is a real possibility. However, there remains the matter of a Presidential veto. President Obama not only supports the FCC's rules, his 2008 campaign promise has been a primary motivating factor for FCC promulgation of these rules. Thus, given the likelihood that, if the Congress were to pass a Resolution of Disapproval, the President would veto it, Sen. Hutchison and other Congressional opponents of the BIAS rules are unlikely to be able to use the CRA to block implementation of the FCC's BIAS rules. Other options available to opponents of the FCC's BIAS rules include passage of an appropriations rider that prevents the FCC from spending any money implementing or enforcing the rules, and a straight piece of legislation barring the FCC from writing BIAS rules, and directing it to vacate its rules. 12/21. Broadband internet access service (BIAS) providers, and the trade groups that represent them, released comments on the Federal Communications Commission's (FCC) adoption of BIAS rules on December 21, 2010. Walter McCormick, head of the US Telecom, stated in a release after the vote that "While we appreciate the hard work and good faith that the Chairman put into this matter, and his proceeding under Title I rather than Title II, we do not support the final rule, and we believe that the Commission will come to regret the action it has taken today as one that is fundamentally inconsistent with the National Broadband Plan’s goals of increased broadband investment, innovation, deployment, and adoption." He continued that "While the order will not affect the open way in which we operate our networks, or afford consumers any advantages that they are not enjoying today, it is -- nevertheless -- an expansive assertion of regulatory authority over the Internet: one that goes far beyond the Waxman legislative proposal, assumes prerogatives that are more appropriately the province of the Congress, and is arbitrary in its application of disparate mandates to competing Internet services, applications, and technologies in ways that have nothing to do with protecting consumers." Kyle McSlarrow, head of the National Cable & Telecommunications Association (NCTA), stated in a release that "Our consistent view has been that the current `openness´ of the broadband marketplace can be preserved while simultaneously fostering the innovation and massive private investment needed to ensure the future growth and vitality of the Internet. While we agree entirely with Commissioners McDowell and Baker that new regulation is not necessary to accomplish that goal, it has been clear for some time that there were three votes at the Commission for rules that would go much farther than those adopted today. Thus, the question before us has been whether rules could be drafted in a manner that avoids a raft of unintended consequences and that preserves broadband providers' ability to innovate and invest in a marketplace that justly represents a great American success story." He continued that "months of negotiations and discussions have led to a rough consensus of rules that we believe can accomplish those goals and avoid the extreme and counterproductive demands for rate regulation, unbundling of networks, and reclassification under Title II. While we will reserve final judgment until after we have an opportunity to closely review the text of the Order once it is released, it appears that the rules themselves contain that compromise consensus." Comcast's David Cohen stated in a release that "the rules as described generally appear intended to strike a workable balance between the needs of the marketplace for certainty and everyone's desire that Internet openness be preserved. Most importantly, this approach removes the cloud of Title II regulation that would unquestionably have harmed innovation and investment in the Internet and broadband infrastructure." Steve Largent, head of the CTIA, stated in a release that "net neutrality rules are unnecessary, and we continue to maintain that net neutrality rules are particularly unnecessary for the wireless industry" He added that "wireless is different". Largent is a former Republican member of the House Commerce Committee (HCC). AT&T's Jim Cicconi stated in a release that "Too often, well-funded ideologues have used intimidation, vilification, and fear-mongering to advance their goal that government control the Internet and other forms of communication without regard for their impact on the jobs and livelihoods of millions already challenged by a difficult economy. The Commission’s apparent rejection of such unfeeling dogma is an added reason to be heartened by today’s FCC vote." • Commentary: Where Are the FCC's BIAS Rules? The House will meet at 11:00 AM for legislative business. It may consider of HR 847 [LOC | WW], the "James Zadroga 9/11 Health and Compensation Act of 2010", S 3481 [LOC | WW], an untitled bill to amend the Federal Water Pollution Control Act regarding storm water, S 372 [LOC | WW], the "Whistleblower Protection Enhancement Act of 2010", and HR 6523 [LOC | WW], the "Ike Skelton National Defense Authorization Act for Fiscal Year 2011". The Senate will meet at 9:00 AM. It will resume consideration of the START treaty. 21/21. Sen. Al Franken (D-MN) argued that the Federal Communications Commission (FCC) did not go far enough in adopting rules for broadband internet access service (BIAS) on December 21, 2010. He stated in a release that "The FCC's action today is simply inadequate to protect consumers or preserve the free and open Internet. I am particularly disappointed to learn that the order will not specifically ban paid prioritization, allowing big companies to pay for a fast lane on the Internet and abandoning the foundation of net neutrality. The rule also contains almost no protections for mobile broadband service, remaining silent on the blocking of content, applications, and devices." He continued that this rule "doesn't go far enough". He concluded that "The FCC must now vigorously enforce what is in the new order and keep its promise of addressing the wireless issue in the near future. I will continue to hold the agency's feet to the fire, ensuring it uses its full authority to keep the Internet free and open. And going forward, I will be looking at all legislative and administrative options to strengthen these protections." Cathy Sloan of the Computer and Communications Industry Association (CCIA), stated in a release that "Chairman Genachowski had it right the first time a year ago and this past spring, before he was worn down by the best funded lobbyists in this business. This is a missed opportunity to clearly protect all Internet users from big telco and cable broadband providers intent on staying deregulated and ensuring quality open Internet access only to the highest commercial bidders." The New America Foundation's (NAF) Sacha Meinrath stated in a release that the FCC rules are "woefully inadequate for protecting the open Internet and for first time explicitly permit providers to discriminate against Internet content and applications. These failures place the Internet in peril of evolving into a system that will more and more resemble another cable network rather than an open Internet." The ACLU's Chris Calabrese stated in a release that "Network neutrality principles are essential to protecting the First Amendment rights of Americans who rely on the Internet as a forum for free speech. While the new FCC rule creates stronger network neutrality protections for Americans who use the wired Internet, it fails to provide adequate protections for Americans who rely on wireless broadband service ... By creating two sets of regulations -- one for the wired Internet and one for wireless broadband -- and failing to ground them in the strongest legal protections available, the FCC has failed to protect free speech and Internet openness for all users. The ACLU will continue to fight for full network neutrality protections. Internet openness is key to protecting our First Amendment rights." Craig Aaron of the Free Press stated in a release that "The new rules are riddled with loopholes". He added that "These rules don't do enough to stop the phone and cable companies from dividing the Internet into fast and slow lanes, and they fail to protect wireless users from discrimination." Gigi Sohn, head of the Public Knowledge (PK), stated in a release that the FCC's rules "fell far short" and "will be subject to manipulation by telephone and cable companies". Andrew Schwartzman of the Media Access Project (MAP) stated in a release that "These rules are riddled with loopholes. They foreshadow years of uncertainty and regulatory confusion, which those carriers will use to their advantage. Those seeking to innovate and invent new uses for digital technologies face the prospect of being blocked, bilked, or intimidated by the carriers who control the pipes. And ordinary people who use the Internet for artistic, social and political expression, not to mention entertainment and gaming, will be denied the full benefits of the Internet." 12/21. Bob Pisano, head of the Motion Picture Association of America (MPAA), stated in a release that under the broadband internet access service (BIAS) rules adopted by the FCC on December 21, 2010, BIAS providers "may take reasonable measures to address copyright infringement without running afoul of open Internet rules." He added that "Under no circumstances should open Internet rules be used to shield copyright infringers." The FCC has not released its Report and Order (R&O), or even the rules adopted thereby. The FCC issued a release that describes the R&O, and contains excerpts therefrom. It makes no reference to intellectual property, copyright or infringement. The FCC release does, however, provide this excerpt from the R&O: "A person engaged in the provision of fixed broadband Internet access service, insofar as such person is so engaged, shall not block lawful content, applications, services, or non-harmful devices, subject to reasonable network management." Blocking unauthorized distribution of copyrighted works would not be blocking "lawful content". None of the Commissioners discussed BIAS providers' blocking of infringing activities in their written statements. 12/21. The FCC has not released the Report and Order (R&O) regarding broadband internet access service (BIAS) that it adopted on December 21, 2010. It has not even released the rules, even though that would be a short document. It only released descriptions of putative rules offered by FCC staff and Commissioners. The FCC process in this proceeding shares many of the attributes of the less transparent FCC proceedings under the leadership of former Chairman Kevin Martin. The FCC released no draft rules when Chairman Julius Genachowski announced on December 1, 2010, that the Commission would adopt rules this month. Commissioner Robert McDowell also noted that "on the night of Friday, December 10, just two business days before the public would be prohibited by law from communicating further with us about this proceeding, the Commission dumped nearly 2,000 pages of documents into the record. As if that weren't enough, the FCC unloaded an additional 1,000 pages into the record less than 24 hours before the end of the public comment period." Chairman Genachowski also ignored a request from House Republicans on December 16 to put the rules out for public comment, or at least to make the latest version of the rules available to the public. See also, story titled "House Republicans Urge Genachowski to Put His Unseen BIAS Rules Out for Comment" in TLJ Daily E-Mail Alert No. 2,182, December 18, 2010. Nevertheless, Genachowski persists in the assertion that the FCC is conducting its operations in an open and transparent manner. He stated at the December 21 event that the process at the FCC under his tenure "has been one of the most transparent in FCC history". Of course, the FCC would have to delay its release of this R&O for many months to match its delay in some other major proceedings. Recall for example the FCC's 2003 triennial review order, adopted on February 20, 2003, but not released until August 21, 2003 (and then overturned on key subjects by the Court of Appeals). In addition to keeping the public uninformed, delay in the release and publication of the Report & Order also has the effect of delaying the filing of the inevitable petitions for review, and the judgment of the Court of Appeals. It also has the effect of delaying the adoption by the Congress of a Resolution of Disapproval (ROD) under the Congressional Review Act (CRA). Unreleased rules nevertheless impact the business planning of affected businesses, and their ability to raise investment capital.